Broteer Furro was born the son of royalty. His father was the Prince of the Tribe of Dukandarra, in Africa. At the age of six, Broteer was captured by slaver traders and was purchased by the steward of the cargo ship for four gallons of rum and a piece of calico. In the belly of the ship, 260 slaves — human cargo — were transported across the Atlantic Ocean headed first for Barbadoes and then Rhode Island. In America, Venture was owned by three separate masters over a period of three decades. Throughout his life as a slave, Venture worked over and beyond the demands of his masters, many times, with their permission, he worked through the night to earn his own wages. Eventually, Venture purchased not only his freedom, but that of his wife, two children and several other slaves. Venture Smith became known as the first African to document his capture from Africa and his life as a slave. 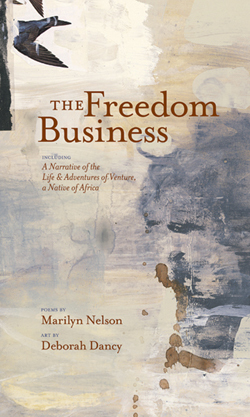 Paired alongside Venture’s narrative are poems written by Connecticut’s Poet Laureate Marilyn Nelson. They are inspired by Venture’s life story, and they are complimented with paintings by artist Deborah Dancy. Marilyn’s words are absolutely beautiful, the work of a true wordsmith. Her poems offer a sharp contrast to Venture’s eighteenth-century prose (though I enjoyed Venture Smith’s narrative, too), while filling in with visual details. I felt, tasted, smelled, her words. Artist Deborah Dancy’s abstract watercolor, ink, collage and acrylic paintings are an extension of her emotional response to Marylin’s poems. As per her art notes toward the end of the book, it wasn’t Deborah Dancy’s goal to illustrate the narrative or poems. She set out to create visual metaphors. A unique book. And a Junior Library Guild selection. I have two free copies of this book I’d like to offer especially to librarians or teachers. Or anyone, really. Shoot me an email (tate2 at AOL dot com) or leave a comment with your contact info. Today I started reading Pemba’s Song co authored by Mariyln Neslon. The writing is beautiful. It’s nice of you to give away two copies I hope they find a good home.